It should be a cute, smart comedy. 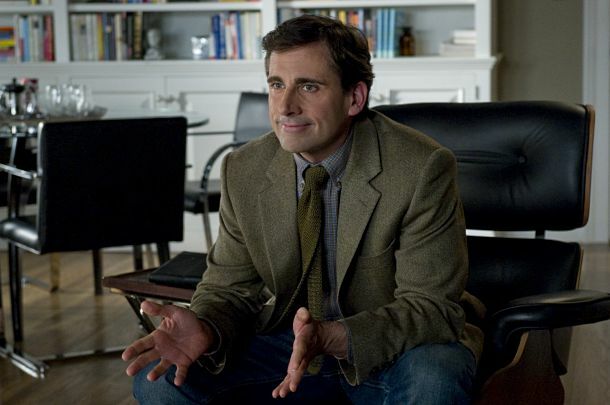 From what I see, Steve Carell's role is mostly dramatic? I'm sure he'll have comedic moments, but this might be his attempt at a foray into drama. Perhaps a bit of a turn for Jones as well, as we rarely see him in light comedies. Meryl's no stranger to it. And by the way, Streepers, this will be a Golden Globe nomination at best. I'm actually glad she's not doing a super baity role right on the heels of her Oscar win for The Iron Lady. This will set her up for August: Osage County much better. Have I mentioned I'm looking forward to that film? For my second entry in this section, I've chosen the role of Patsy Cline in 1985's Sweet Dreams. Minnesota native (woot woot!) Jessica Lange was nominated for an Oscar for her role as country music's first female megastar. This is the part which Meryl has openly described as the one she really wanted, even begged for, but did not get. Director Karel Reisz, who had directed Meryl to her first lead actress Oscar nomination four years earlier in The French Lieutenant's Woman, evidently had Lange in mind for the role from the get-go. To be honest, based simply on resemblance to Cline, Lange seemed like a far better fit than Streep. That in mind, I wouldn't (sweet) dream of underestimating Meryl's talent for executing convincing portrayals. She had obviously found in the script a connection to the main character. Plus, it was clearly very Oscar-baity. I imagine had Streep been cast, the physical resemblance questions would've melted away within her first few onscreen moments. Ok, Ed Harris looks like a clone of Michael Fassbender in Shame. I wager that Meryl was attracted to this role not just for the script, but for the fact that it's a role portraying a singer. Lange obviously lip-synced to Cline's recordings, so I suppose the same would've been done for Meryl. I don't know whether or not Lange can sing, but we know Meryl can, and probably in nearly the same vocal fach as Cline. However, with a voice as recognizable and iconic as was Cline's, I imagine the director would've insisted on the original recordings, possibly to Meryl's chagrin. At least she would've been able to try her hand at the very distinguished-sounding Virginian accent. Gawd. Both Out of Africa and Plenty were released in 1985. The shooting schedule for Africa was several months long, and I can't imagine that Plenty's was a breeze either. Would we have been denied Meryl's participation in either of these films had she been given the role in Sweet Dreams? We can only wonder. I doubt she would've passed on the role of Karen Blixen, and shooting schedules can likely be shifted a bit in order to accommodate actors. I have a feeling I wouldn't have terribly missed Plenty, especially if Sweet Dreams had ultimately become part of Meryl's film canon. Regardless, this is one that got away. We can expect a trailer within the next month I would think? I haven't seen Testament or Educating Rita so I can't comment on the performances of those two ladies, but with the very "overdue" status of Maclaine in this year, it was likely pretty clear who would walk away with Oscar. Holy 80's hair, Liza. Some fun wit from Maclaine at the beginning of the speech. She gets a little preachy and weird for my liking, but hey, it's a stage with the whole world as your audience, so say what you want. And sheesh, they just let 'em talk as long as they wanted back then. Suppose that's why the shows used to last like five hours. Imagine what an amazing race this would've been if Meryl hadn't won the year before. I still think I would've given the edge to Maclaine, considering it was her sixth nomination to Meryl's fifth, and Meryl had already won in supporting four years prior for Kramer vs Kramer. This was the first of twelve consecutive losses for Meryl until her win for The Iron Lady less than two months ago. Incroyable. News is out that Meryl will be performing at the Delacorte Theater this summer after all. She'll join her Sophie's Choice co-star Kevin Kline in a one-night-only staged reading of Shakespeare's Romeo and Juliet for a Public Theater Gala that will also honor Al Pacino. I really don't care about this news. Just thought it was worth mentioning since there was some buzz about her possibly being in a different production this summer in Central Park. Tickets run at a reasonable $1500. Damn, if only I weren't busy June 18. Tune it tomorrow, Streepers. I'll probably do a new Academy Awards analysis. BTW, can we get a cast list for August: Osage County already? One would think they'd have this wrapped up only four months prior to shooting. Staying tuned for that one too. There is some news buzzing on the possibility of Meryl's involvement in a production at the Delacorte Theater in Central Park this summer as The Witch in Steven Sondheim's Into the Woods. Sondheim evidently would not deny or confirm the rumor in an interview with a British newspaper in February, but it appears the Witch is the only remaining role to be officially cast. Certainly this is all currently gossip, but Meryl has been saying for some time in interviews how much she'd like to do more stage work. And, I didn't know that Rob Marshall was working to adapt a screen version of the musical. What better stepping stone into the eventual film role than for Meryl to wet her feet in the play this summer prior to the start of filming August: Osage County?! Speaking of August (which I'm obsessed with), Julia Roberts said in an interview this past week that she "can't wait!" and that it's "a dream come true." One can only presume that she's referring to the chance of working with Meryl. Get this movie going!